This article is about the film. For the franchise, see Tron (franchise). For other uses, see Tron (disambiguation). Kevin Flynn is a leading software engineer formerly employed by the computer corporation ENCOM, who now runs a video arcade and attempts to hack into ENCOM's mainframe system. However, ENCOM's Master Control Program (MCP) halts his progress. Within ENCOM, programmer Alan Bradley and his girlfriend, engineer Lora Baines, discover that the MCP has closed off their access to projects. When Alan confronts the senior executive vice president, Ed Dillinger, Dillinger claims that the security measures are an effort to stop outside hacking attempts. However, when Dillinger privately questions the MCP, he discovers the MCP has expanded into a powerful virtual intelligence and has become power-hungry, illegally appropriating personal, business, and government programs to increase its own capabilities. The MCP blackmails Dillinger with information about his plagiarizing Flynn's games if he does not comply with its directives. Lora deduces that Flynn is the hacker, and she and Alan go to his arcade to warn him. Flynn reveals that he has been trying to locate evidence proving Dillinger's plagiarism, which launched Dillinger's rise in the company. Together, the three form a plan to break into ENCOM and unlock Alan's "Tron" program, a self-governing security measure designed to protect the system and counter the functions of the MCP. Once inside ENCOM, the three split up and Flynn comes into direct conflict with the MCP, communicating with his terminal. Before Flynn can get the information he needs to reveal Dillinger's acts, the MCP uses an experimental laser to digitize and download Flynn into the ENCOM mainframe cyberspace, where programs are living entities appearing in the likeness of the human "Users" (programmers) who created them. Flynn learns that the MCP and its second-in-command, Sark, rule and coerce programs to renounce their belief in the Users. The MCP forces programs that resist to play in deadly games and begins pitting Flynn in duels. Flynn meets other captured programs, Ram and Tron, between matches. Partnered, the three escape into the mainframe during a light cycle match, but Flynn and Ram become separated from Tron by an MCP pursuit party. While attempting to help Ram, who was wounded in the pursuit, Flynn learns that he can manipulate portions of the mainframe by accessing his programmer knowledge. Ram recognizes Flynn as a User and encourages him to find Tron and free the system before "derezzing" (dying). Using his new ability, Flynn rebuilds a vehicle and disguises himself as one of Sark's soldiers. Tron enlists help from Yori, a sympathetic program, and at an I/O tower, receives information in his identity disk from Alan necessary to destroy the MCP. Flynn rejoins them, and the three board a hijacked solar sailer to reach the MCP's core. However, Sark's command ship destroys the sailer, capturing Flynn and Yori, and presumably killing Tron. Sark leaves the command ship and orders its deresolution, but Flynn keeps it intact by again manipulating the mainframe, while Sark reaches the MCP's core on a shuttle carrying captured programs. While the MCP attempts to absorb captive programs, Tron, who turns out to have survived, confronts Sark and critically injures him, prompting the MCP to give him all its functions. Realizing that his ability to manipulate the mainframe might give Tron an opening, Flynn leaps into the beam of the MCP, distracting it. Seeing the break in the MCP's shield, Tron attacks through the gap and destroys the MCP and Sark, ending the MCP's control over the mainframe, and allowing the captured programs to communicate with users again. Flynn reappears in the real world, rematerialized at his terminal. Tron's victory in the mainframe has released all lockouts on computer access, and a nearby printer produces the evidence that Dillinger had plagiarized Flynn's creations. The next morning, Dillinger enters his office and finds the MCP deactivated, and the proof of his theft publicized. Flynn is subsequently promoted to CEO of ENCOM, and is happily greeted by Alan and Lora as their new boss. Bridges also portrays Clu (Codified Likeness Utility), a hacking program developed by Flynn to find evidence of Dillinger's theft in the mainframe. Bruce Boxleitner as Alan Bradley, Flynn's work partner and fellow programmer at ENCOM. David Warner as Ed Dillinger, the Senior Executive Vice President of ENCOM and former co-worker of Flynn's, who used the MCP to steal Flynn's work and pass it off as his own, earning himself a series of undeserved promotions. Warner also portrays Sark, a command program developed by Dillinger to serve as the MCP's second-in-command. Warner also provides the uncredited voice of the Master Control Program (MCP), a rogue artificial intelligence operating system (originally a chess program created by Dr. Gibbs and "improved" by Dillinger) which monitors and controls ENCOM's mainframe. Cindy Morgan as Dr. Lora Baines, Bradley's co-worker and girlfriend, as well as assistant to Dr. Gibbs on the digitization experiment. Barnard Hughes as Dr. Walter Gibbs, a co-founder of ENCOM running the company's science division, who creates the SHV 20905 digitizing laser with Dr. Baines's assistance. Hughes also portrays Dumont, a "guardian" program developed by Dr. Gibbs to protect input/output junctions in the mainframe. Hughes also provides the uncredited voice of the Master Control Program's original incarnation. Tony Stephano as Peter, Dillinger's assistant. Stephano also portrays Sark's Lieutenant. The inspiration for Tron occurred in 1976 when Steven Lisberger, then an animator of drawings with his own studio, looked at a sample reel from a computer firm called MAGI and saw Pong for the first time. He was immediately fascinated by video games and wanted to do a film incorporating them. According to Lisberger, "I realized that there were these techniques that would be very suitable for bringing video games and computer visuals to the screen. And that was the moment that the whole concept flashed across my mind". Lisberger had already created an early version of the character 'Tron' for a 30 second long animation which was used to promote both Lisberger Studios and a series of various rock radio stations. This backlit cel animation depicted Tron as a character who glowed yellow; the same shade that Lisberger had originally intended for all the heroic characters developed for the feature-length Tron. This was later changed to blue for the finished film (see Pre-production below). The prototype Tron was bearded, and resembled the Cylon Centurions from the original 1978 TV series, Battlestar Galactica. Also, Tron was armed with two "exploding discs", as Lisberger described them on the 2-Disc DVD edition (see Rinzler). Lisberger elaborates: "Everybody was doing backlit animation in the 70s, you know. It was that disco look. And we thought, what if we had this character that was a neon line, and that was our Tron warrior – Tron for electronic. And what happened was, I saw Pong, and I said, well, that's the arena for him. And at the same time I was interested in the early phases of computer generated animation, which I got into at MIT in Boston, and when I got into that I met a bunch of programmers who were into all that. And they really inspired me, by how much they believed in this new realm." In 1980, they decided to take the idea to the Walt Disney Studios, which was interested in producing more daring productions at the time. Tom Wilhite, Disney's vice president for creative development, watched Lisberger's test footage and convinced Ron Miller to give the movie a chance. However, Disney executives were uncertain about giving $10–12 million to a first-time producer and director using techniques which, in most cases, had never been attempted. The studio agreed to finance a test reel which involved a flying disc champion throwing a rough prototype of the discs used in the film. It was a chance to mix live-action footage with back-lit animation and computer-generated visuals. It impressed the executives at Disney and they agreed to back the film. The script was subsequently re-written and re-storyboarded with the studio's input. At the time, Disney rarely hired outsiders to make films for them and Kushner found that he and his group were given a less than warm welcome because they "tackled the nerve center – the animation department. They saw us as the germ from outside. We tried to enlist several Disney animators but none came. Disney is a closed group." as a result of this, they hired Wang Film Productions for the animation. Because of the many special effects, Disney decided in 1981 to film Tron completely in 65-mm Super Panavision (except for the computer-generated layers, which were shot in VistaVision and both anamorphic 35mm and Super 35 which were used for some scenes in the "real" world and subsequently "blown up" to 65mm). Three designers were brought in to create the look of the computer world. French comic book artist Jean Giraud (also known as Moebius) was the main set and costume designer for the film. Most of the vehicle designs (including Sark's aircraft carrier, the light cycles, the tank, and the solar sailer) were created by industrial designer Syd Mead. Peter Lloyd, a high-tech commercial artist, designed the environments. Nevertheless, these jobs often overlapped, leaving Giraud working on the solar sailer and Mead designing terrain, sets and the film's logo. The original 'Program' character design was inspired by Lisberger Studios' logo of a glowing bodybuilder hurling two discs. To create the computer animation sequences of Tron, Disney turned to the four leading computer graphics firms of the day: Information International, Inc. of Culver City, California, who owned the Super Foonly F-1 (the fastest PDP-10 ever made and the only one of its kind); MAGI of Elmsford, New York; Robert Abel and Associates of California; and Digital Effects of New York City. Bill Kovacs worked on the film while working for Robert Abel before going on to found Wavefront Technologies. The work was not a collaboration, resulting in very different styles used by the firms. Tron was one of the first films to make extensive use of any form of computer animation, and is celebrated as a milestone in the industry though only fifteen to twenty minutes of such animation were used, mostly scenes that show digital "terrain" or patterns or include vehicles such as light-cycles, tanks and ships. Because the technology to combine computer animation and live action did not exist at the time, these sequences were interspersed with the filmed characters. The computer used had only 2 MB of memory, and no more than 330 MB of storage. This put a limit on detail of background; and at a certain distance, they had a procedure of mixing in black to fade things out, a process called "depth cueing". The film's Computer Effects Supervisor Richard Taylor told them "When in doubt, black it out! ", which became their motto. Originally the film was meant to use white backgrounds like in THX 1138 inside the Grid, but it would require such huge amounts of lights that it was decided to use black backgrounds instead. The computers at the time could not do animation, so the frames had to be produced one by one. In some of the more complex sequences, like the Solar Sailer moving through metal canyons, each frame could take up to six hours to produce. There was no way to digitally put them on film either, which would be solved by putting a motion picture camera in front of the computer screen and capture each individual frame. Most of the scenes, backgrounds, and visual effects in the film were created using more traditional techniques and a unique process known as "backlit animation". In this process, live-action scenes inside the computer world were filmed in black-and-white on an entirely black set, placed in an enlarger for blow-ups and transferred to large format Kodalith high-contrast film. These negatives would then be used to make Kodalith sheets with a reverse (positive) image. Clear cels were laid over each sheet and all portions of the figure except the areas that were exposed for the later camera passes were manually blacked out. Next the Kodalith sheets and cel overlays were placed over a light box while a VistaVision camera mounted above it made separate passes and different color filters. A typical shot normally required 12 passes, but some sequences, like the interior of the electronic tank, could need as many as 50 passes. About 300 matte paintings were made for the film, each photographed onto a large piece of Ektachrome film before colors were added by gelatin filters in a similar procedure as in the Kodaliths. The mattes, rotoscopic and CGI would then be combined and composed together to give them a "technological" appearance. With multiple layers of high-contrast, large format positives and negatives, this process required truckloads of sheet film and a workload even greater than that of a conventional cel-animated feature. The Kodalith was specially produced as large sheets by Kodak for the film and came in numbered boxes so that each batch of the film could be used in order of manufacture for a consistent image. However, this was not understood by the filmmakers, and as a result glowing outlines and circuit traces occasionally flicker as the film speed varied between batches. After the reason was discovered, this was no longer a problem as the batches were used in order and "zinger" sounds were used during the flickering parts to represent the computer world malfunctioning as Lisberger described it. Lisberger later had these flickers and sounds digitally corrected for the 2011 restored Blu-ray release as they were not included in his original vision of the film. Due to its difficulty and cost, this process of back-lit animation was not repeated for another feature film. Sound design and creation for the film was assigned to Frank Serafine, who was responsible for the sound design on Star Trek: The Motion Picture in 1979. At one point in the film, a small entity called "Bit" advises Flynn with only the words "yes" and "no" created by a Votrax speech synthesizer. BYTE wrote "Although this film is very much the personal expression of Steven Lisberger's vision, nevertheless [it] has certainly been a group effort". More than 569 people were involved in the post-production work, including 200 inkers and hand-painters, 85 of them from Taiwan's Cuckoo's Nest Studio. Unusually for an English-language production, in the end credits the Taiwanese personnel were listed with their names written in Chinese characters. This film features parts of the Lawrence Livermore National Laboratory; the multi-storey ENCOM laser bay was the target area for the SHIVA solid-state multi-beamed laser. Also, the stairway that Alan, Lora, and Flynn use to reach Alan's office is the stairway in Building 451 near the entrance to the main machine room. The cubicle scenes were shot in another room of the lab. At the time, Tron was the only film to have scenes filmed inside this lab. The original script called for "good" programs to be colored yellow and "evil" programs (those loyal to Sark and the MCP) to be colored blue. Partway into production, this coloring scheme was changed to blue for good and red for evil, but some scenes were produced using the original coloring scheme: Clu, who drives a tank, has yellow circuit lines, and all of Sark's tank commanders are blue (but appear green in some presentations). Also, the light-cycle sequence shows the heroes driving yellow (Flynn), orange (Tron), and red (Ram) cycles, while Sark's troops drive blue cycles; similarly, Clu's tank is red, while tanks driven by crews loyal to Sark are blue. Because of all the personal information about citizens which exist inside computer networks, such as social security number and driver's license, the idea was that each real world person has a digital counterpart inside the Grid based on information about them, which is why it was decided to use some of the same actors in both worlds. Budgeting the production was difficult by reason of breaking new ground in response to additional challenges, including an impending Directors Guild of America strike and a fixed release date. Disney predicted at least $400 million in domestic sales of merchandise, including an arcade game by Bally Midway and three Mattel Intellivision home video games. The producers also added Easter eggs: during the scene where Tron and Ram escape from the Light Cycle arena into the system, Pac-Man can be seen behind Sark (with the corresponding sounds from the Pac-Man arcade game being heard in the background), while a "Hidden Mickey" outline (located at time 01:12:29 on the re-release Blu-ray) can be seen below the solar sailer during the protagonists' journey. Tron was originally meant to be released during the Christmas season of 1982, but when chairman of the Disney board Card Walker found out the release date of Don Bluth's film The Secret of NIMH was in early July, he rushed it into a summer release to be able to compete with Bluth, and it ended up competing with films like E.T. the Extra-Terrestrial, Star Trek II: The Wrath of Khan, Blade Runner and Poltergeist. The soundtrack for Tron was written by pioneer electronic musician Wendy Carlos, who is best known for her album Switched-On Bach and for the soundtracks to many films, including A Clockwork Orange and The Shining. The music, which was the first collaboration between Carlos and her partner Annemarie Franklin, featured a mix of an analog Moog synthesizer and Crumar's GDS digital synthesizer (complex additive and phase modulation synthesis), along with non-electronic pieces performed by the London Philharmonic Orchestra (hired at the insistence of Disney, which was concerned that Carlos might not be able to complete her score on time). Two additional musical tracks ("1990's Theme" and "Only Solutions") were provided by the American band Journey after British band Supertramp pulled out of the project. An album featuring dialogue, music and sound effects from the film was also released on LP by Disneyland Records in 1982. The film was well received by critics. Roger Ebert of the Chicago Sun-Times gave the film four out of four stars and described it as "a dazzling movie from Disney in which computers have been used to make themselves romantic and glamorous. Here's a technological sound-and-light show that is sensational and brainy, stylish and fun". However, near the end of his review, he noted (in a positive tone), "This is an almost wholly technological movie. Although it's populated by actors who are engaging (Bridges, Cindy Morgan) or sinister (Warner), it's not really a movie about human nature. Like Star Wars or The Empire Strikes Back but much more so, this movie is a machine to dazzle and delight us". Ebert closed his first annual Overlooked Film Festival with a showing of Tron. Gene Siskel of the Chicago Tribune also awarded four out of four stars, calling it "a trip, and a terrifically entertaining one at that...It's a dazzler that opens up our minds to our new tools, all in a traditional film narrative." Tron was also featured in Siskel and Ebert's video pick of the week in 1993. InfoWorld's Deborah Wise was impressed, writing that "it's hard to believe the characters acted out the scenes on a darkened soundstage... We see characters throwing illuminated Frisbees, driving 'lightcycles' on a video-game grid, playing a dangerous version of jai alai and zapping numerous fluorescent tanks in arcade-game-type mazes. It's exciting, it's fun, and it's just what video-game fans and anyone with a spirit of adventure will love—despite plot weaknesses." On the other hand, Variety disliked the film and said in its review, "Tron is loaded with visual delights but falls way short of the mark in story and viewer involvement. Screenwriter-director Steven Lisberger has adequately marshalled a huge force of technicians to deliver the dazzle, but even kids (and specifically computer game geeks) will have a difficult time getting hooked on the situations". In her review for The New York Times, Janet Maslin criticized the film's visual effects: "They're loud, bright and empty, and they're all this movie has to offer". The Washington Post's Gary Arnold wrote, "Fascinating as they are as discrete sequences, the computer-animated episodes don't build dramatically. They remain a miscellaneous form of abstract spectacle". In his review for The Globe and Mail, Jay Scott wrote, "It's got momentum and it's got marvels, but it's without heart; it's a visionary technological achievement without vision". On review aggregation website Rotten Tomatoes rated the film at 71% based on the reviews of 55 critics, with an average rating of 6.4/10. The website's consensus states: "Though perhaps not as strong dramatically as it is technologically, TRON is an original and visually stunning piece of science fiction that represents a landmark work in the history of computer animation." In the year it was released, the Motion Picture Academy refused to nominate Tron for a special-effects award because, as director Steven Lisberger puts it, "The Academy thought we cheated by using computers". The film did, however, earn Oscar nominations in the categories of Best Costume Design and Best Sound (Michael Minkler, Bob Minkler, Lee Minkler, and James LaRue). In 1997, Ken Perlin of the Mathematical Applications Group, Inc. won an Academy Award for Technical Achievement for his invention of Perlin noise for Tron. The film, considered groundbreaking, has inspired several individuals in numerous ways. John Lasseter, head of Pixar and Disney's animation group, described how the film helped him see the potential of computer-generated imagery in the production of animated films, stating "without Tron, there would be no Toy Story." The music video of the song "Abiura di me" of the Italian rapper Caparezza is based on Tron. The two members of the French house music group Daft Punk, who scored the sequel, have held a joint, lifelong fascination with the film. In the music video for the song "Feel Good Inc." by Gorillaz, Russel, the fictional drummer of the band, can be seen wearing an Encom hat. Tron developed into a cult film and was ranked as 13th in a 2010 list of the top 20 cult films published by The Boston Globe. The film heavily inspired the music video for Danish pop/dance group Infernal’s 2006 hit single From Paris to Berlin. The Disco Biscuits, a Philadelphia-based jam band heavily influenced by electronic music, played an entire free-form set to correspond with the movie "Tron", which was projected onto a partially transparent curtain in the front of the stage for their 12/31/2015 New Year's Eve show from the PlayStation Theater in Times Square, New York city. In 2008, the American Film Institute nominated this film for its Top 10 Science Fiction Films list. Tron made its television debut, as part of The Disney Channel's first day of programming, on April 18, 1983 at 7:00PM (ET). Tron was originally released on VHS, Betamax, LaserDisc, and CED Videodisc in 1983. As with most video releases from the 1980s, the film was cropped to the 4:3 pan and scan format. The film saw multiple re-releases throughout the 1990s, most notably an "Archive Collection" LaserDisc box set, which featured the first release of the film in its original widescreen 2.20:1 format. By 1993, Tron had grossed $17 million in video rentals. 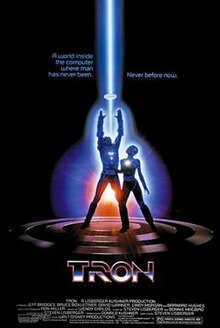 Tron saw its first DVD release on May 19, 1998. This bare-bones release utilized the same non-anamorphic video transfer used in the Archive Collection LaserDisc set, and did not include any of the LD's special features. On January 15, 2002, the film received a 20th Anniversary Collector's Edition release in the form of a special 2-Disc DVD set. This set featured a new THX mastered anamorphic video transfer, and included all of the special features from the LD Archive Collection, plus an all-new 90 minute "Making of Tron" documentary. To tie in with the home video release of Tron: Legacy, the movie was finally re-released by Walt Disney Studios Home Entertainment on Special Edition DVD and for the first time on Blu-ray Disc on April 5, 2011, with the subtitle "The Original Classic" to distinguish it from its sequel. Tron was also featured in a 5-Disc Blu-ray Combo with the 3D copy of Tron: Legacy. The film was re-released on Blu-ray and DVD in the UK on June 27, 2011. "Tron: Uprising takes place during the time period between the story lines of the two movies Tron (1982) and Tron: Legacy (2010). In the series, young program Beck becomes the leader of a revolution inside the computer world of The Grid, tasked with the mission of freeing his home and friends from the reign of Clu and his henchman, Gen. Tesler. To prepare for the challenge, Beck is trained by Tron - the greatest warrior The Grid has ever known - who mentors Beck as he grows beyond his youthful nature into a courageous and powerful leader. Destined to become the system's new protector, Beck adopts Tron's persona to battle the forces of evil." On January 12, 2005, Disney announced it had hired screenwriters Brian Klugman and Lee Sternthal to write a sequel to Tron. In 2008, director Joseph Kosinski negotiated to develop and direct TRON, described as "the next chapter" of the 1982 film and based on a preliminary teaser trailer shown at that year's San Diego Comic-Con, with Lisberger co-producing. Filming began in Vancouver, British Columbia in April 2009. During the 2009 Comic-Con, the title of the sequel was revealed to be changed to Tron: Legacy. The second trailer (also with the [Tron: Legacy] logo) was released in 3D with Alice In Wonderland. A third trailer premiered at Comic-Con 2010 on July 22. At Disney's D23 Expo on September 10–13, 2009, they also debuted teaser trailers for Tron: Legacy as well as having light cycle and other props from the film there. The film was released on December 17, 2010, with Daft Punk composing the score. ^ Jackson, Matthew (2013-03-01). "Little-known sci-fi fact: Why Tron's FX got snubbed for an Oscar". SYFY WIRE. Retrieved 2019-01-22. ^ Schneider, Michael (4 November 2010). "Disney XD orders 'Tron: Legacy' toon". Variety. Archived from the original on 30 June 2012. Retrieved 9 November 2010. ^ a b c Culhane, John (July 4, 1982). "Special Effects are Revolutionizing Film". New York Times. Archived from the original on September 15, 2012. Retrieved 2009-01-28. ^ a b c d e f g h i j k l m n Patterson, Richard (August 1982). "The Making of Tron". American Cinematographer. ^ "Interview: Justin Springer and Steven Lisberger, co-producers of Tron: Legacy". Archived from the original on 2012-09-15. ^ a b c d Ansen, David (July 5, 1982). "When You Wish Upon a Tron". Newsweek. ^ "In70mm.com". Archived from the original on 2012-09-15. ^ "The influence of Disney's Tron in filmmaking Tron and CG moviemaking". Archived from the original on 2012-07-07. ^ Sorensen, Peter (November 1982). "Tronic Imagery". BYTE. p. 48. Retrieved 19 October 2013. ^ "The People of NIF: Rod Saunders: Each Day is an Adventure". Archived from the original on 2012-08-05. ^ New William Kallay book reveals "How Tron Changed Visual Effects and Disney Forever"
^ Moog, Robert (November 1982). "The Soundtrack of TRON" (PDF). Keyboard Magazine: 53–57. Archived from the original (PDF) on 2010-12-02. Retrieved 2009-07-16. ^ "Tron". Box Office Mojo. Archived from the original on 2012-07-22. Retrieved 2008-07-09. ^ a b Ebert, Roger (January 1, 1982). "Tron". Chicago Sun-Times. Archived from the original on September 15, 2012. Retrieved 2008-07-09. ^ "Roger Ebert's Overlooked Film Festival #1 Schedule". Archived from the original on July 10, 2012. Retrieved December 18, 2009. ^ Siskel, Gene (July 9, 1982). "Marvelous 'TRON' sends Disney soaring into the '80s". Chicago Tribune. Section 3, p. 1-2. ^ Deborah Wise, "Unabashed fan and critics' critic talk about Disney's Tron," InfoWorld Vol. 4, No. 30 (Aug 2, 1982): 70-71. ^ "Tron". Variety. January 1, 1982. Archived from the original on September 15, 2012. Retrieved 2008-07-09. ^ Maslin, Janet (July 9, 1982). "Tron". New York Times. Archived from the original on September 15, 2012. Retrieved 2008-07-09. ^ Arnold, Gary (July 10, 1982). "Duel of Two Disneys". Washington Post. pp. C1. ^ Scott, Jay (July 10, 1982). "Tron Beautiful but Heartless". The Globe and Mail. ^ Helfand, Glen (January 9, 2002). "Tron 20th Anniversary". San Francisco Gate. ^ "The 55th Academy Awards (1983) Nominees and Winners". oscars.org. Archived from the original on 2012-09-05. Retrieved 2011-10-09. ^ Kerman, Phillip. Macromedia Flash 8 @work: Projects and Techniques to Get the Job Done. Sams Publishing. 2006. ^ Thompson, Anne (December 9, 2010). "What Will Tron: Legacy's 3D VFX Look Like in 30 Years?". Tron Legacy VFX Special Effects in Tron Legacy. Popular Mechanics. Archived from the original on 15 September 2012. Retrieved 24 December 2010. ^ Lyons, Mike (November 1998). "Toon Story: John Lasseter's Animated Life". Animation World Magazine. Archived from the original on 29 June 2012. Retrieved 13 October 2010. ^ Boston.com Staff (August 17, 2006). "Top 20 cult films, according to our readers". boston.com. The Boston Globe. Archived from the original on July 30, 2012. Retrieved December 27, 2010. ^ Daley, Brian (1 October 1982). Tron. New English Library Ltd. ISBN 0-450-05550-7. ^ "Tron Sector Biography of Mike Bonifer". Archived from the original on 2008-06-09. ^ "Exploring the 'Tron' Phenomenon". The Disney Channel Magazine. The Disney Channel. April–May 1983. ^ "Tron — Archived Edition LaserDisc Box Set". LaserDisc Database. Archived from the original on 2012-09-15. Retrieved 2012-02-13. ^ Kinder, Marsha (1993). Playing with Power in Movies, Television, and Video Games: From Muppet Babies to Teenage Mutant Ninja Turtles. University of California Press. p. 12. ISBN 9780520077768. ^ "tron uprising - Google Search". www.google.com. Retrieved 2016-04-24. ^ Fleming, Michael (January 12, 2005). "Mouse uploads Tron redo". Variety. Archived from the original on September 15, 2012. Retrieved 2008-07-09. ^ Kit, Borys (September 11, 2007). "New Tron races on". The Hollywood Reporter. Archived from the original on 2008-06-15. Retrieved 2008-07-09. ^ "Feature films currently filming in BC". Archived from the original on 2012-05-26. ^ "Comic Con: Disney Panel, Tron 2 Revealed Live From Hall H!". Cinemablend.com. Archived from the original on 2012-09-04. Retrieved 2009-07-25. ^ Roush, George (23 July 2009). "Comic-Con 2009: Disney Panel TRON Legacy & Alice In Wonderland!". Latino Review. Archived from the original on July 25, 2009. Retrieved 2009-07-23. ^ Anderson, Kyle. "'Tron: Legacy' Soundtrack: Get Ready For The Game With Daft Punk". MTV. Archived from the original on 15 September 2012. Retrieved 30 December 2010. Wikimedia Commons has media related to Tron (film).